Portadown visit Cliftonville tomorrow (Saturday) aiming to secure a third successive Danske Bank Premiership victory for the first time in this season’s campaign. The Ports kicked off the opening week with back-to-back defeats of Crusaders and Warrenpoint Town before struggling for consistency. Saturday’s 3-2 defeat of Ballymena United arrived off a 1-0 win over Carrick Rangers and manager Ronnie McFall is keen on building momentum. “We scored some good goals and didn’t let the heads drop at 2-2 but kept going for the win,” said McFall. 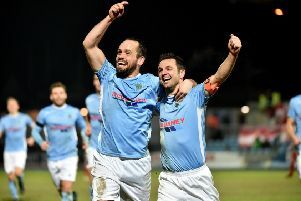 “We showed character and can now face Cliftonville with a boost in confidence. “We do not have a great record against Cliftonville and every match in this league is a dog fight. “However, players coming back to fitness can only help, with Peter McMahon getting stronger and Mark McAllister working hard and back in the starting line-up.